According to our J-school pals at UK site SPOnG, Nintendo quietly released something called the DS Slide Controller just a few days ago. The device, available only in Japan, incorporates at least some of the motion-sensing features the recent patent described. The Slide Controller costs ¥5,800 ($48) and comes with a puzzle-style game called ‘MagKid, Slide Adventure’ that focuses on repairing a clunky old robot. When attached to the DS Lite it translates real-world tilting into onscreen action. According to the MagKid website, there are three different actions possible using the Slide Controller - circular motion that generates a ‘power-up’ action, side-to-side zigzagging for navigating mazes or avoiding enemies and rapid jerks for attacking opponents. 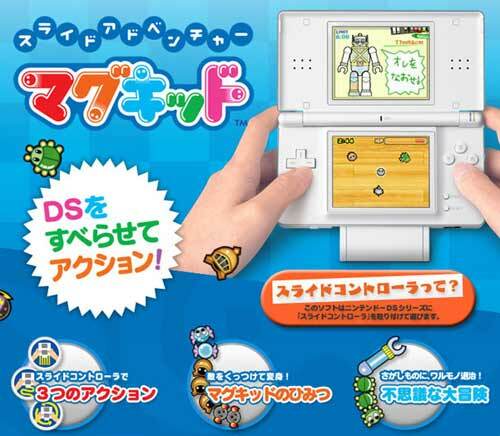 Multiplayer action is also a feature, allowing up to four DS Lite owners to compete against each other in mini games, such as pool and fishing. Although the games look pretty simple in the various videos on the MagKid website, only a fool would doubt that Nintendo has hit upon another winning formula for opening our wallets.